Laparoscopic Gastric Bypass in 1,692 Patients. Objective: To evaluate the outcomes of a single surgeon’s experience with laparoscopic Roux-en-Y gastric bypass (LRYGB) utilizing the “Frantzides-Madan Triple Stapling Technique” for creation of the jejunojejunostomy. 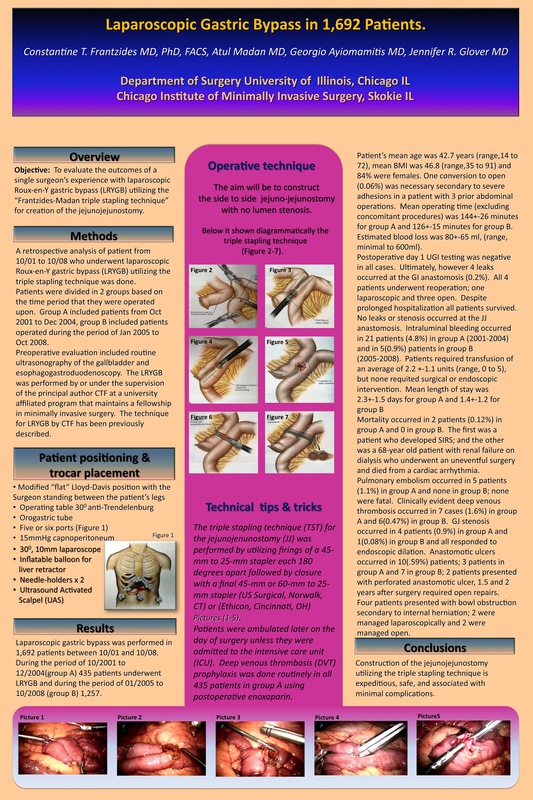 Methods: A retrospective review of patients who underwent LRYGB utilizing the triple stapling technique for creation of the Jejunojejunostomy (JJ) from October 2001-October 2008 was performed. This technique has been previously described. Results: LRYGB was performed in 1,692 consecutive patients. The mean age was 42.7 years (range 14 to 72), and 84% were female. Mean initial body mass index was 46.8 (range 35 to 91). One conversion to open (0.06%) was necessary. Mean operating time was 130 +/- 18 minutes. Mean length of stay was 2.2 +/- 1.3 days. There were 4 (0.2%) leaks all at the gastrojejunostomy, 10 (0.59%) anastomotic ulcers and 5 (0.29%) stenosis. No leaks or stenosis occurred at the JJ anastomosis. Interaluminal bleeding occurred in 26 patients (1.5%). Patient required blood transfusion of 2.2 +/- 1.1 units (range 0 to 5), but none required surgical or endoscopic intervention. Pulmonary embolism occurred in 5 (0.29%) patients and DVT in 13 (0.76%) patients. Four patients presented with internal herniation (0.23%). Mortality occurred in 2 (0.12%) patients. Mean excess body weight loss was 73% at 1 year. Conclusion: Construction of the jejunojejunostomy utilizing the “Frantzides-Madan Triple Stapling Technique” is expeditious, safe and associated with minimal complications.